You might call me a Professional House Guest. My husband and I are involved in ministry with Emmaus Bible Courses (ECS Ministries). We're sort of "missionaries on loan" to ECS. We travel the world inspiring, challenging, and encouraging believers around the world who work with the Emmaus Bible Courses in one of the 120 languages in over 100 countries. We get to go to a lot of places! We both love to travel, learn about countries, experience different cultures, and, most of all, see people excited about studying the Bible! Whether they use the Emmaus Bible Courses or some other method, we just want people to get into the Word of God. We don't travel like business people, with a generous expense account and in 5 star hotels. We stay with the people. This is great because we get to sit around their table, to know them, and learn about real life in their part of the world. So for about three months of the year, on 4 or 5 different trips, we are professional house guests. We have appreciated everyone who has us stay with them. Some people have very little, but share it generously. Some people we have stayed with are very well to do and give us luxury accommodations. We've slept in kids' bedrooms, master bedrooms, and livingroom floors. One time we stayed with a family in India who built a second floor on their home just so they could house "The Lord's servants." What an example! For the first time in our lives we have a "guest room" in our own home, simply by virtue of our nest working it's way toward empty. I love it that I can house extra people very easily, but we've also forced the kids out of their rooms, slept on an air mattress in our family room, put a cousin of mine on a couch with make shift curtains for privacy, and put our granddaughter in our closet(!) to make room for people in our house. 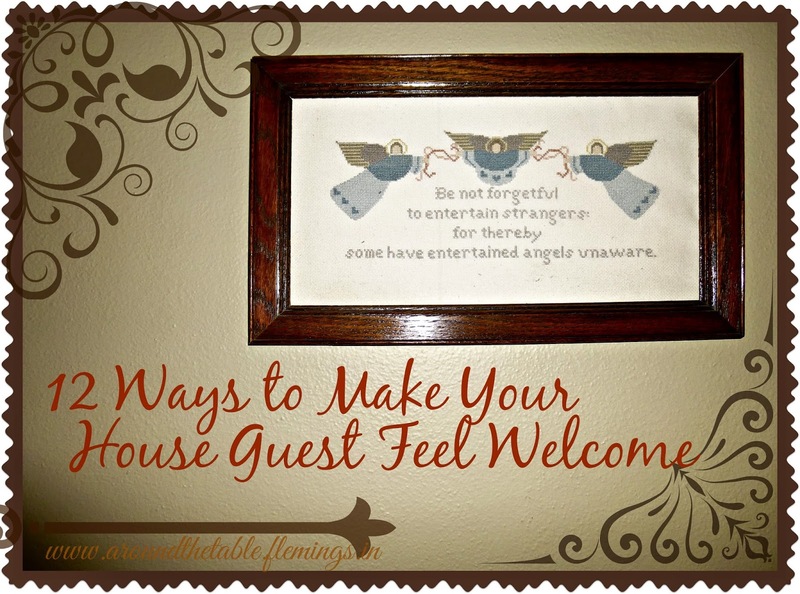 Whatever you do, when you are called on to house people overnight, you can make them feel welcome. Here are twelve ways to do that. 1. Privacy -- My dream house would have a private bathroom for each guest room, but since I don't have that, I at least hang curtains over a doorway to the family room if my guests, or I, end up sleeping there. This gives them a place to change clothes without occupying the bathroom. 2. Mirror -- I've stayed in many places where there's no mirror in the bedroom and no outlet in the bathroom. I've pretty much learned to blow dry my hair by "Braille," but I would still like to know I look reasonable when I step out of my room to face my hosts. 3. Towels -- I always put clean towels on the bed in our guest room. If there's a couple staying in there, I give them matching, but distinct colors so they can tell them apart. I also point out the hooks on the back of the bedroom door where they can hang them if they don't want to leave them in the bathroom. This saves my furniture from having wet towels draped over it. 4. Chair -- My husband loves a room with a desk where he can feel organized and sit down to write his reports, figure out accounts, and study for his next sermon (which he usually preaches by the dozen on our trips). A desk usually comes with a chair! But if there isn't a desk, a chair is always nice for ease of putting on socks and shoes and other tasks that are best done sitting. It just makes life easier. 5. Hangers -- If there is a closet or a small place where clothes can be hung on hangers, that helps so much. 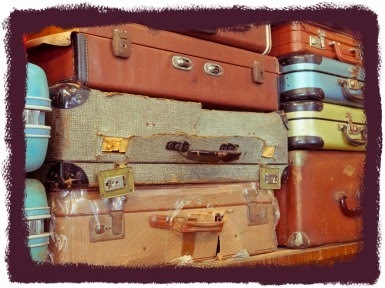 Long term living out of a suitcase is difficult and we like to unpack a bit and feel a little less wrinkled. Along with the space, a few hangers are wonderful. 6. Empty Drawers -- My husband always unpacks as much as he can. At first I thought that put him in danger of leaving things behind, but I've learned it is wonderful if I can slide the suitcase under the bed and just open a well organized drawer to find my things. Now, I just need to keep my guest room drawers from becoming storage bins! 7. Water -- Many of the places we go we can't drink the water and our hosts leave a bottle of water in our room. They soon learn that the Flemings need two or more two liter bottles a day! At our house, the water is potable, but I always offer our guests a glass of water to take to their room at night. It's nice to have something to drink within reach, and maybe take an evening or morning pill with. 8. Morning Schedule -- I stayed with a family once where one member needed the only bathroom from 6 to 7 in the morning. I was glad they told me the night before so I could sneak in before six for just a minute! If someone has to be to work or school, let your guests know, so they aren't making life difficult for you, nor you for them. 9. Soap and Shampoo -- I've left my shampoo in Africa, Asia, North and South America, Europe, and Australia. (See #6) Very often, that's not a problem because at the next place there will be a basket of hotel size shampoo, soap, conditioner, and lotion samples. Whew! I have one in my "guest" bathroom now, too. 10. TP -- One of my callings in life is to change the roll of toilet paper. When my kids were growing up I began to believe that I was the only one in the house who knew how to do that! But it seems that I am doomed to a life of finding the last square on the roll. Sigh. Thankfully, most of my hosts have had an extra roll cleverly hidden under a crocheted "TP hat," or in a cupboard within reach of the...well, within reach. That's where I keep mine. Open a door, you'll find it. 11. Wifi -- One of the first things my husband does at someone's house is walk into the living room holding his iPad and asking if they have wifi and what the password is. Part of his ministry involves staying in touch with those other 99 countries while visiting this one. When I have traveled alone, I've often been too shy to ask, even though, I wanted it to stay in touch with family and not just goof off. If you have wifi, offer the password, maybe on a piece of paper on the desk in your guest room. One last trick I've learned is: spend the night in your guest room. When my husband and I "rented" my parents' master bedroom from them for nine months, they took over my old room. The next day my dad was fixing a cupboard door that had never closed properly during the eight years I'd lived in that room! You never know what you'll learn in your own house! Your guests will enrich your lives as you spend time with them around your table, and you can make them feel welcome and their stay comfortable. What a great list! We don't travel very often, so it's really helpful to see things from the perspective of someone who does. Thanks so much for linking up to Thrive @ Home Thursday. I'll be featuring you on the next Thrive @ Home post! This is a fabulous post and is a great list for anyone staying in our homes. I added some things to my list. Thanks.